... everything you wanted to know about automated parking. Conveyors are an obvious choice for moving cars inside automated parking systems for many reasons. The long history of conveyors and the extensive experience in many applications demonstrate why conveyors are the perfect complement to automated parking systems. Around 1800 AD, the first conveyors were made from leather, canvas or rubber and used to transport grain short distances. Modest developments in conveyors continued through the 1800s, but industrialization accelerated technological advances starting in the early 1900s. Steel conveyor belts were introduced in 1901 and conveyor belts developed for coal mining in 1905 revolutionized the mining industry. The first patent for roller conveyors was issued in 1908 and Henry Ford introduced conveyor belts into his Highland Park, Michigan factory in 1913. The world's longest conveyor belt system (98 km/61 miles with multiple belts) was built across the Sahara Desert in the mid-1970s. The system, visible from space, continues in service after nearly 40 years moving up to 2,000 tons per hour of phosphate. The world's longest conveyor belt (31 km/19 miles) was put in service in 2015 moving up to 2,400 tons per hour of coal in South Africa. 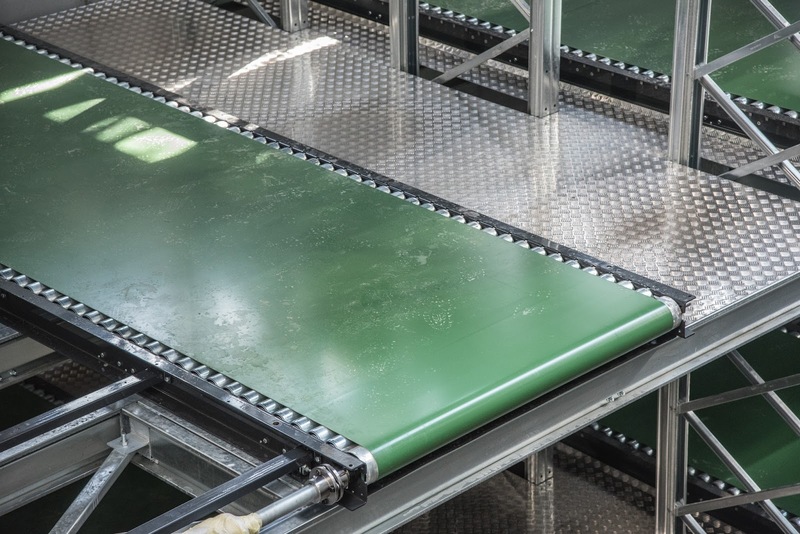 There are many types of conveyor systems, however, belt-type conveyor systems are very widely used in industrial applications, including material handling, automated storage and retrieval, sorting, distribution and packaging. 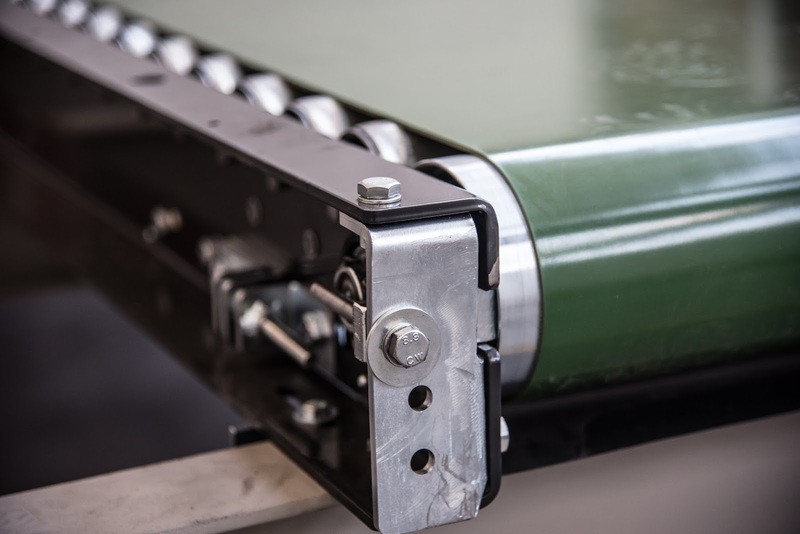 The advantages of roller conveyor belt systems for automated parking applications come from their simplicity, efficiency, durability and reliability. It's hard to beat the simplicity of a roller conveyor belt system. The roller (a wheel and axle) is one of the five basic machines (lever, wheel/axle, pulley, ramp/wedge and screw). Rollers make it easy to move even heavy weights such as cars by greatly reducing friction. Roller CBS also offer are efficiency of motion and energy efficiency. CBS have only two motions: the rollers and belt move in one direction or the opposite direction…that's it. There are no wasted motions such as deadheading, raising, lowering, extending, retracting, swinging, folding, etc. Similarly, energy efficiency comes in two forms: using less energy because of the greatly reduced friction (minimal force needed movement objects) and not requiring energy to lift the entire weight of the car off the ground. Reliability and availability/uptime are the preconditions for the economical applications in many industries. The most popular solution for moving materials and objects from one point to another is the conveyor…and quite frequently the belt and roller conveyor. The reliability and availability of these systems generally results from the basic nature and low stress of individual components: low friction bearings, multiple rollers sharing weight, optimized roller spacing, etc. Operating in hostile environments transporting tons and tons of dirty, abrasive materials such as coal, ore and gravel for decades over long distances is ample evidence of the conveyor belt systems' durability. In comparison, the use of conveyor belts to move cars in automated parking applications is far easier. Beyond the simplicity, efficiency, durability and reliability, conveyor belt systems offer other advantages. Without wasted motions and movement, CBS tend to be much faster than other types of transport technologies used in automated parking systems. They also tend to utilize common "off-the-shelf" components, which leads to increased reliability, durability and parts availability as well as lower costs and inventory. To be fair, conveyor belt systems are not nearly as interesting to watch as robotic and other transport systems that move like an elaborate mechanical ballet. The CBS just keeps doing the job dependably, very fast, year-after-year and decade-after-decade. Small Parking Spaces. Big Cars. Mechanical, Robotic, Rotary Parking, etc.